A Basingstoke reverend who has Type 2 diabetes is one of the faces for the new '100 things I wish I'd known about diabetes' campaign,. 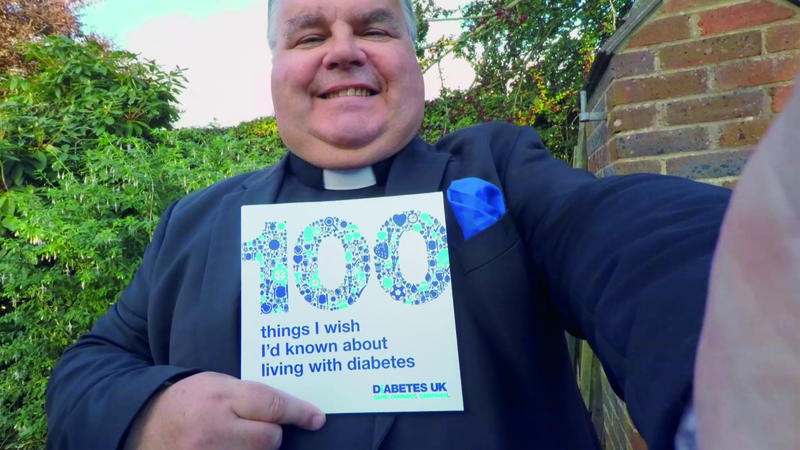 A Basingstoke reverend who has Type 2 diabetes is one of the faces for the new '100 things I wish I'd known about diabetes' campaign, which sees people living with the condition sharing their advice with others who have been affected by diabetes. The free book, published by Diabetes UK, is full of everyday tips offered by people living with diabetes for other people living with diabetes. Mark Christian (57) was diagnosed in 2008 with Type 2 diabetes as a result of a routine checkup. He was in the army and about to be deployed to Iraq and a blood test revealed high blood sugar. He manages his condition with tablets and daily injections by adopting a low carbohydrate diet. Mark will be seen in TV and print adverts for the campaign, which is also being promoted through on TV, online and in print ads. With new figures released today by the charity showing that 700 people a day are diagnosed with diabetes in the UK - that's one person every two minutes - the charity says that people often say their diabetes diagnosis leaves them isolated and with unanswered questions. To help people get a better understanding of their diabetes, the charity has enlisted the support of people with diabetes to share great tips and handy hints across every aspect of life with the condition, from going on holiday and eating out, working out and managing diabetes alongside work, relationships and more. Mark said: “The treatment of diabetes, in my view, is most effective when it is an open collaboration between medical professionals and the person with diabetes. This requires the person with diabetes to take responsibility by being fully informed about the condition and their own personal manifestation of it. This book of 100 tips by diabetics, for diabetics significantly helps. I think I am pretty well informed and was shocked to find that I do not know it all!! “I have a very good friend with diabetes who provides the personal support I need - the rest comes from my diabetic nurse and wandering around the internet. Jill Steaton, Diabetes UK South East Regional Head, said: “We are really grateful to Mark for starring in our '100 things I wish I'd known about diabetes' campaign. With it being focused on people with diabetes sharing advice with others who are living with the condition we were delighted to have the support of someone who lives with the condition day in and day out for our campaign. All 100 tips in the book were submitted by people with diabetes, reviewed by the charity's clinical team and shortlisted by a panel of people with diabetes.